This change also follows the shift from Google Currents on Android, where the Currents mobile app has now been deprecated (though it continues to be listed) in favor of Google’s own Newsstand service. The new iOS app’s look-and-feel falls in line with Google’s “Material Design” language, which is making its way to all of Google’s properties, including Android, Chrome and Google’s web and mobile apps. In the updated iOS Newsstand app, which is now represented by a blue and white icon that looks something like a newspaper with a page folded down (or confusingly, a little bit like the Google Docs icon turned on its side), Google has introduced revamped top-level navigation for browsing through the news content. There are now a few categories to help readers manage their subscriptions as well as dive into reading the news they care about, including a “Read Now” section which points you to the articles and editions from publications and feeds you currently subscribe to; “My Library,” which is a list of your Newsstand subscriptions; and “Topics,” a way to subscribe to areas of interest. 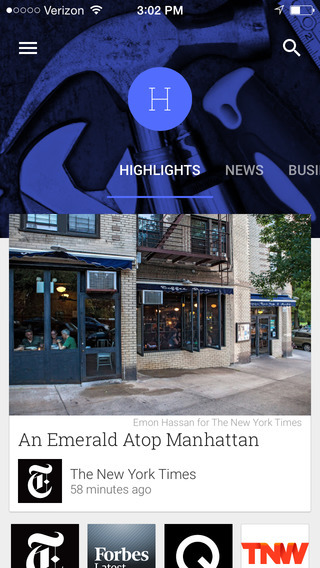 You’ll also note as you browse through Newsstand that articles are tagged by topic. For example, an article about melting glaciers may be tagged “Climate,” another about connected cars may be tagged “Automobile,” and so on. When you tap on these tags, you’re then redirected to a page containing other news from that same category, and you can quickly tap the plus (“+”) button at the top to subscribe to all the latest updates from that category going forward. Many of the tags are a bit too broad as to serve as a useful curation tool for managing your news reading, with a number of tags encompassing categories like “Health,” “Design,” “Business,” and more. After all, you may want to follow a specific sub-category like “Digital Health” or “Health Care,” for example, not just all health news. But even if the article isn’t tagged with a narrower category in the news reader itself, you can do a search for the subcategory from the app’s search button and then subscribe. You can also bookmark articles for later reading, browse news highlights, and read across general news sections, like “Sports” or “World,” which is handy for those who don’t want to manage their own list of subscriptions.